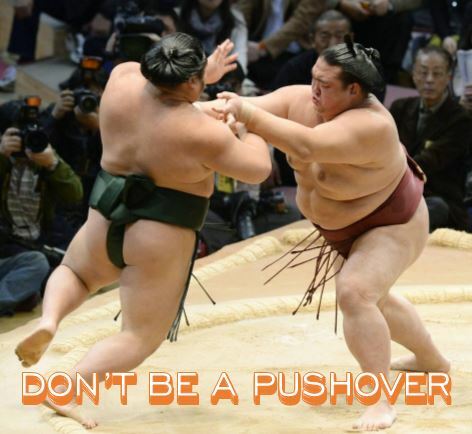 Don’t Be A Pushover is another simple group game that pits pairs of individuals against each other in a tournament style bracket. Another great game if you’re short on prep time, because there is no set-up and it requires no materials. To play Don’t Be A Pushover you will need to have participants face each other with their feet shoulder width apart (they can not stagger their feet to strengthen their stance). The distance between the two individual facing each other will should be about 18″. Once in position, the goal is to try and push their opponent over by using only the palms of their hands. If their opponent falls or moves even one foot, either from pushing or losing their balance, they are out. If both move, then whoever lifts their foot first is the one that is out. If a tie, they play again. Depending on how many people you have, you may choose to go best two out of three. Otherwise, just take the winners and keep pairing the group down until you have your final four. Bring them up front to play against each other until you have a champion. 1. Have a designated area for the winners to go to. This will speed the process up. 3. Have some fun music playing and award the champion a prize of some sorts for their efforts.